Aretino was in business operating from about 1907 to 1914. 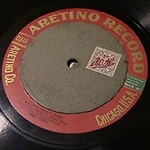 Aretino was started by Arthur J. O’Neill, who was linked to several Chicago-area record and phonograph operations. O’Neill named this company in honor of Guido Aretino, an 11th-century Italian monk. 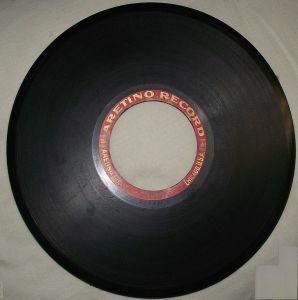 Aretino is an oddity distinguished by its records' spindle hole, the largest ever produced for commercial purposes. Aretino did not produce any of its own recordings, but it leased masters from other companies. The first series of Aretino records were a single-sided A-prefix sequence that originated from Leeds & Catlin. This supplier also manufactured a double-sided D-prefix series which is scarce. 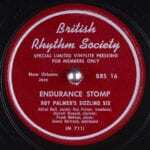 After Leeds & Catlin was shut down by courts for patent infringement, production was moved briefly to Hawthorne & Sheble and Zonophone, continuing as an A-prefix single sided series. Soon afterwards, Columbia became the sole supplier. 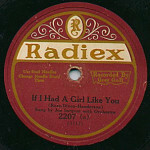 These D-prefix double-sided discs numbering above 500 are the most commonly found. 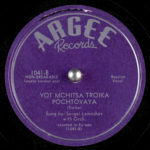 Columbia also produced an A-prefix series and a 12-inch double-sided series. Aretino ceased operations in 1914.